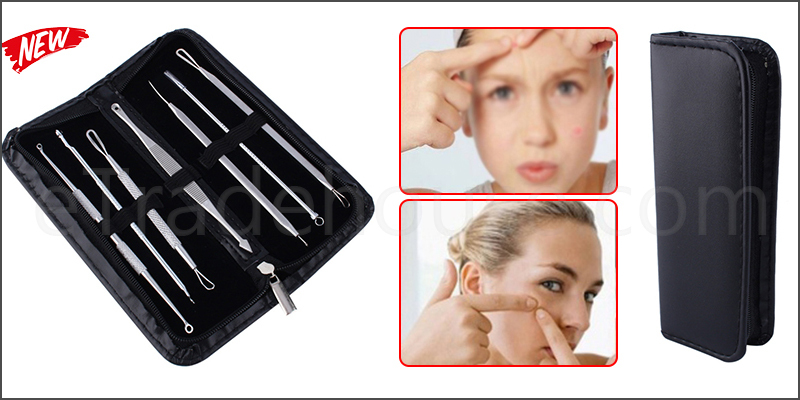 100% Brand new and High Quality Acne Remover Needle Tools. Never try to pick or squeeze spots as it bruises the skin and may cause scarring to minimize damage to your skin. The correct time to remove blackheads is immediately after shower or use warm face towel for about 1-2 minutes as the steam opens up pores. Simply place the loop end over the top of the blackhead and gently press. It should just pop out easily. If needed, use the needle and carefully pick the surface of your skin if your pores are not matured. Using this remover tool is one of the safest ways to clear your pores, rather than squeezing blackheads using your fingernails. It will also less entrauma to the surrounding skin. To minimize damage to your skin this is an effective way to remove blackheads, simply place the loo pend over the top of the blackhead and gently press, it should just pop out easily. 1x 7pcs Blackhead Pimple Blemish Acne Extractor Remover Tool Set Kit.